Russian-born Joe Deninzon has been at the forefront of violin technology and performance for more than a decade. Whether teaching “fiddle funk” or :fusion violin” at Mark Wood’s rock orchestra camps, slaying on his seven-string Viper electric with band Stratospheerius, or exploring acoustic jazz with his self-named trio, Joe pushes the limits to what can be done musically on the violin. Stratospheerius stretches the prog umbrella with a unique style once described as “psycho-jazz trip funk.” It’s eclectic mix evokes Frank Zappa, Dixie Dregs, and Mahavishnu Orchestra, featuring Joe’s thought-provoking, skilled musicianship and inspired imagination. Further reference points include Bela Fleck, John Medeski, even the Dave Matthews Band, making his work a favorite with the jam scene enthusiasts. Stratospheerius does not play what you want; it plays things you didn’t know you wanted. In the following interview, the New York-based Deninzon discusses new Stratospheerius album The Next World…and his take on progressive music from a violin-centric point of view. Progression: The violin is a unique lead instrument for rock-oriented music. How did this become your instrument of choice? Deninzon: “I led two parallel lives growing up. My father was and is a violinist in the Cleveland Orchestra. My mother is a concert pianist and my uncle is a viola player, so I always had classical music in the house. I was handed a violin when I was 6 years old and went through the Suzuki and Russian method studies. We were new to America. I really wanted to fit in and fell in love with rock n roll, and later, jazz. I had no concept at the time that any of that music could be played on the violin. So when I was 12, I took upthe bass guitar and formed my first band. I started writing songs with lyrics around that time, so the first instrument I learned to improvise on actually was the bass. The two years later I taught myself guitar. So I was playing bass in my high school jazz band and guitar in various local bands while idolizing Jimi Hendrix, Jimmy Page, and Steve Vai. But my violin life was ust playing classical music. Things changed for me at age 16 when popular Cleveland rocker Michael Stanley heard me and invited me to play a show with his band on violin. This actually came easy to me, as I already knew the language because of playing guitar and bass. It was a big turning point, and was reviewed in the Cleveland Plain Dealer newspaper. My guitar teacher then turned me on to Jean-Luc Ponty and I was really inspired by him. I wanted to go to Berklee College of Music and be a guitar player, but I wound up going to Indiana University, double majoring in classical music performance and jazz violin. O found that most violinists had a very clean sound. Stephane Grappelli and Ponty had that clean, pure sound. I never heard the violin equivalent of a Jimmy Page or a Keith Richards, or someone that had a little grit to their style. The real turning point for me was hearing Jerry Goodman playing ‘Celestial Terrestrial Commuters’ with Mahavishnu Orchestra. Jerry was the closest I had heard to that gritty sound, and that’s when I decided this is what I was meant to do. I became obsessed with Mahavishnu and Frank Zappa. Zappa violinist Sugarcane Harris also had that grit to his playing. He had that raw, bluesy sound that didn’t sound studied; it was so raw and emotional. In 1995, I bought my first electric violin, a six-string Jensen. I made my first three albums using that violin and in 2003 bought the seven-string fretted Viper electric violin made by Mark Wood. Progression: What made you move to an electric violin? What can you convey musically with this electric that you couldn’t with an acoustic? Progression: Do you use MIDI effects? Deninzon: “I don’t use MIDI because that can make your violin sound exactly like other instruments. I still want it to sound like a violin, but maybe a violin tripping on acid! I like using stomp boxes and still retain the essence of the violin. MIDI is great for composition and arranging, though. Progression: Tell us how your first album came about. Deninzon: “After graduating from Indiana University, I recorded my first album, Electric/Bue, in Cleveland. It was basically an instrumental fusion album that got really good reviews and I used some amazing jazz musicians I had come to know in Cleveland. I moved to New York to go to Manhattan School of Music and my next few years in New York were spent free-lancing, playing gigs, going through many different bands and figuring out what I really wanted to do. Progression: You still perform some of those early songs in your concerts today. Progression: It was about this time that Stratospheerius came about? Progression: Where did the name Stratospheerius come from? Deninzon: “I hate to use labels, but if we had to use just one, I would call us a progressive rock band. There are some folks that have a very strict definition of what jazz is, of what punk rock is, of what progressive rock is. When you jam band, some think that somehow you have to sound like the Grateful Dead or Phish. When you think progressive rock, some feel you have to write 20-minute epic songs like ‘Close to the Edge.’ Sometimes, we just want to write that three-minute song that rocks your socks off, or a song that incorporates some ska influences, etc. These might not fall into that narrow category. Progression: Prog can be a big umbrella. Progression: How has the band evolved and changed musically over the years? Deninzon: “ We are more of a rock band now. It started out being more of a jazz-fusion band—me being surrounded by jazz and be-bop heads and just having that influence. I’ve always wanted to marry it with my love of songwriting, songs with hooks, hard rock, and vocals. Figuring out how to do that has been a long journey for me, but with the last two albums, I figured out the sound I really want with this band. I get to scratch all those itches. Progression: Cover art for The Next World… is quite striking and has that otherworldly look to it. Who created it and was it done specifically for this album? Deninzon: “It was not done specifically for this album. Bob Bowen, a dear friend of mine for 13 years, drew that. He played bass on the Headspace album as well as my jazz trio disc. He was killed in a bicycle accident in 2010 and I wanted to dedicate this album to his memory. I wasn’t sure what to do for the cover, but I remembered Bob was always drawing when we were on the road. I talked to his family and they shared his art with me, and this piece really jumped out at us. Progression: What is important to you in assembling a supporting cast of musicians? Do you have permanent band members? Deninzon: “Each lineup has lasted about three years, as everyone gets so busy and has so many projects. Lucianna Padmore,our drummer, has been with us almost the entire way. The band lineup right now on the new album has been together since 2008 and is the best lineup I have ever had. What I love about this band is that no one tries to overplay. Everybody knows their role and works well as an ensemble, a team. I need guys that know when to play the song and lay back but shred when necessary. “Lucianna is a groove mistress. It is as if she can read my mind and knows what I’m going to do, so I feel like I can do no wrong when she is playing behind me. She comes from a rhythm & blues/funk background and gives the band that really raw backbeat I love, even with some of these crazy time signatures. “Jamie Bishop,our bass player, also comes from a funk background. He is a really understated bass player. He’s very different from Rufus, who was a chops monster with lots of crazy Jaco (pastorius) licks, but Jamie is so solid and just lays it down and he is a really funny guy. Aurelien Budynek is our guitarist. Guitar is probably the most difficult role to fill in this band, because you have to have a great jazz harmonic sensibility, have lots of chops, and be very diverse with a rock foundation. What I like about Aurelien is that he does not overplay and he knows how to support. But when it’s time for him to step up, his solos are ridiculous. And he contributes great background vocals. Progression: You also sing. What do you like to explore lyrically? Progression: How do Stratospheerius live shows differ from the studio albums? What can fans expect from a Stratospheerius show? Progression: You mentioned recording your recently released jazz trio album, Exuberance. Please explain the difference between Stratospheerius and the Joe Deninzon Trio, and the role each plays in your career. Deninzon: “I was so focused on playing the electric violin and playing fusion and progressive music for many years, but I also enjoy playing jazz. I am a huge Grappelli fan, as well as Stuff Smith and Mark O’Connor. I was inspired by O’Connor’s amazing Hot Swing jazz trio and always wanted to do something with that instrumentation. So myself, Bob Bowen on bass and Steve Benson on guitar began working on ideas. We did some Steely Dan covers, some jazz standards. I wanted to go completely opposite of what people have known me to do-acoustic violin, upright bass, hollow-body guitar. The whole concept was what if Grappelli had joined Radiohead and did some of these rock songs with his feel. We also threw in some classical arrangements. I really wanted to have an outlet where I could focus on the acoustic side of things. Progression: You have worked with many other artists over the yearsd. What was it like working with Ritchie Blackmore on the 2003 Blackmore’s Night album Ghost of a Rose? Progression: You also have performed with the Zappa-based band Project/Object.. Progression: With your recent Plugging In electric violin instruction book and ongoing involvement in music camps, you have been very active in the education end of rock and jazz violin. Why are you so passionate about this? Deninzon: “I have always enjoyed teaching and see a lot of opportunities for string players. It really started when I would get asked for recommendations for gigs I couldn’t commit to, and it was hard coming up with musicians that were active in the electric violin world. Secondly, a number of people cam to me saying, “I have an electric violin and I don’t know how to make it sound good.’ Or, ‘I don’t know anything about amps or improvising.’ Many students wanted to venture into the world of playing rock or jazz on electric violin and wanted guidance. I saw a void that needed to be filled, and it’s fun for me teaching kids and adults and giving them information I wish I had when I was 16. That’s why I wrote the book. And that is also why I enjoy teaching at the Mark O’Connor and Mark Wood camps. Progression: What is next for you and Stratospheerius? Deninzon: “We’re writing new music for the next album. We already have two new songs we’re playing live. We want the next album to be more raw, live-sounding, riff-oriented music. We’re also making a music video for [album track’ One Foot in the Next World and working on doing some late-night television appearances. “For me personally, I have many string arrangements of some tock music that I’ll be making available online. I will also be writing more for Sweet Plantain, which is a string ensemble that works with jazz and Latin rhythms. For now, I am working on some chamber music projects involving the electric violin, utilizing effects and some crazy loops. My dream is to write and perform an electric violin concerto-that is definitely on my bucket list. 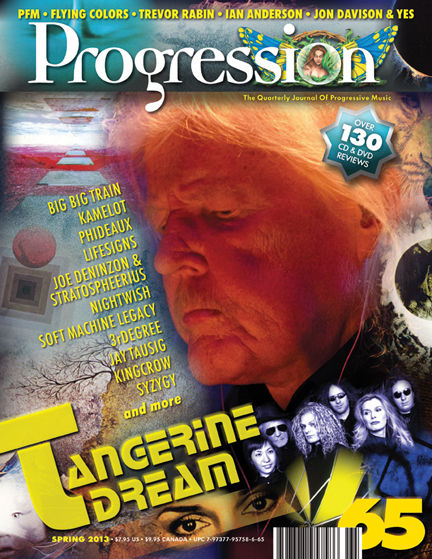 Joe Deninzon Interview for Downbeat Magazine "Prog Talk"
With a musical background that encompasses classical, jazz, rock, world and all points in between, violinist-mandolinist-vocalist-bandleader Joe Deninzon is a whirling dervish of vibrant creativity. He is one of those folks who seem to have a limitless supply of intriguing ideas. Deninzon is the embodiment of a true progressive artist, with jazz at his sonic core. “I was a jazz major in school, and that jazz influence has always been infused in our music,” he said. Deninzon was born in St. Petersburg, Russia, and is the son of a concert violinist father and a concert pianist mother. He grew up and was raised in Cleveland, and studied classical and jazz violin at Indiana University. After relocating to New York City in 1998, Deninzon recorded his first venture into the jazz-fusion milieu, Electric/Blue. Its release was concurrent with the budding string player’s burgeoning career as a freelance studio musician and sideman. He was also studying at the Manhattan School of Music and teaching at The New School for Jazz and Contemporary Music. It was there that he met and began a musical partnership with guitarist Alex Skolnick, known for his work in the metal genre. The two of them pooled their love of electric Miles Davis, Weather Report, Mahavishnu Orchestra and the like into an exciting new ensemble called Stratospheerius. This collaboration resulted in the 2002 CD The Adventures Of Stratospheerius. The 12-track album consisted mostly of Deninzon’s compositions along with interpretations of songs by Wayne Shorter, Vince Guaraldi and Stevie Wonder. Stratospheerius established itself as a high-energy performance entity, with extended jams, sophisticated improvisation and intricate violin/guitar interplay, as evidenced on the 2004 concert disc Live Wires. The album was a turning point for Deninzon and company in numerous ways. Jake Ezra replaced Skolnick on guitar, and it was the debut for drummer Lucianna Padmore, a fellow New School alum. They also trimmed the outfit from a sextet to a lean-and-mean foursome, with Ron Baron on bass. 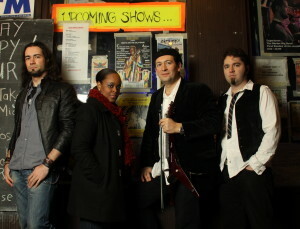 In 2007 the album Headspace took the band in a slightly different direction as more overt funk and jazz styles were laced with increasing melodic and progressive rock overtones. More personnel changes transpired as bassist Bob Bowen and guitarist Mack Price joined Padmore for the expansion of their sound. Around this juncture Deninzon took a break from the fusion world, teaming with bassist Bowen and guitarist Steve Benson in the acoustic Joe Deninzon Trio, which recorded the 2010 jazz albumExuberance. It was at this point where the versatile violinist took a step back to his musical beginnings and cast all of his improvisational influences together in a fresh light. Following Straospheerius guitarist Price’s departure and Bowen’s tragic death in a biking accident, Deninzon recruited French guitarist Aurelien Budynek and bassist Jamie Bishop in 2008. This has been the group’s most consistent and enduring lineup thus far, documented on the 2012 CD The Next World. The all-original excursion contains a lot of jazz-influenced music, such as the dynamic and atmospheric disc opener “Release,” while the instrumental “Fleshbot” has a lot of fire à la violinists Jean-Luc Ponty and Didier Lockwood. “Missing Link” matches odd time signatures with strong vocal hooks, and “Ballad For Ding Bang” is a sweet dedication to Deninzon’s son Max that features smooth chord changes and delicate accents by Padmore.